What is an HID kit? HID (High Intensity Discharge) refers to lighting technology that relies on an electrical charge to ignite xenon gas contained in a sealed bulb. A normal halogen bulb uses a filament which can burn out in as little as 250 hours. HID bulbs are gas filled capsules that are rated for a lifespan of nearly 4000 hours. HID bulbs also shine much brighter due to this technology. Unlike halogen bulbs, HID's emit a type of light that closely resembles natural daylight and is therefore easier on human eyes. In fact, HID lights are currently used in most sports arenas, stadiums, and train stations worldwide. Don't be fooled by lower end Xenon replica bulbs sold at most retail shops. They are no match for the intensity, purity, and efficiency of high intensity discharge headlights. Keep in mind that HID bulbs higher than 8000 Kelvin rating are not D.O.T. approved. 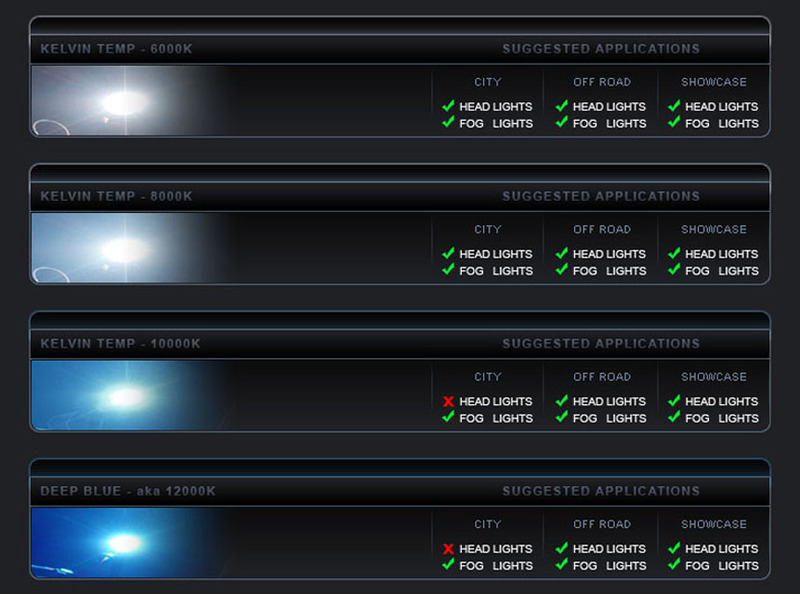 HID color temperature differences. . .
Color temperature describes the hue of a light source. It's based on experiments conducted by physicist William Kelvin. He heated carbon which gave off different colored light as it grew hotter. HID (High Intensity Discharge) lights are high-powered headlamps with warm and cool colors. If HID bulbs are placed in the wrong headlamps there will be glare in some parts of the beam pattern and insufficient light in others, making them dangerous and often illegal.